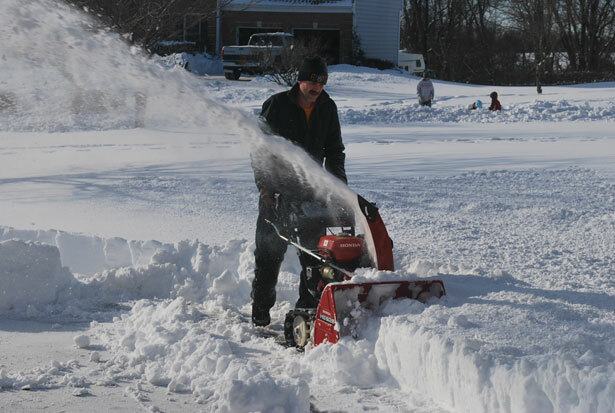 How to Avoid Snowblower Injuries? Injuries related to Snow Blower accidents are among the most gruesome injuries related to snow storm hazards. As New Yorkers are gearing up for a massive snow storm this week-end, many home owners will use a snow blower to clean their driveway or sidewalk. The use of a snow blower can speed up and facilitate snow removal but it can cause severe injuries if people are not careful. Thousands of people are missing fingers because they were injured in a snowblower accident. According to statistics, the typical patient visiting the ER after a snow blower accident is a 44 year old male with amputation of the tip of the fingers with the middle one being the most commonly amputated. Typically the patient has been removing some heavy wet snow, exactly like the one expected in New York on Sunday morning, and his machine got clogged. He then tries to unclog the snowblower using his hand, the blade rotates and the accident occurs. Even if the machine is off the blade can still rotate and that’s how many people get injured. They believe that because the machine is turned off they are safe. Please never use your hands to unclog your snow blower! Many manufacturers are providing special devices to unclog snow blowers and you should use them!A snowblower injury can alter your life forever. While a few people only lose a little bit of skin off the tip of the fingers, most people sustained much more severe injuries that involve bone, tendons or joints. Amputations are frequent and the less soft tissue left covering the finger the more the surgeon will have to cut in the bone. Partial or complete amputation of one or several fingers can have life changing repercussions. For people who are using their hands for their vocation such as surgeons or pianists it can have dramatic consequences.